A MAN IN his 20s was rushed to hospital after being stabbed in Temple Bar in Dublin city early this morning. Gardaí attended the scene of the stabbing, which occurred at about 1.20am. They described the incident as a “serious assault” but further information on the extent of the victim’s injuries was not available. A man in his late 40s has been arrested in relation to the incident and is currently being detained at Pearse Street Garda Station. 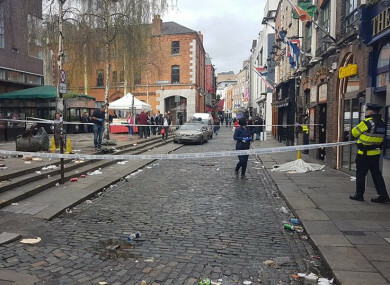 Email “Man rushed to hospital after being stabbed in Temple Bar ”. Feedback on “Man rushed to hospital after being stabbed in Temple Bar ”.